THE DISCIPLE FINALLY GETS IT! Once a disciple went to a preceptor and requested him to impart to him the Supreme Knowledge of the Self (Brahma-thathvam). The Guru gave him a manthra (a sacred utterance) and asked him to recite it continually without any selfish desire. The Guru told him that after he has done this whole-heartedly for a year he could come and receive the Brahma-Jnaana (knowledge of the Self). The disciple came back after a year duly carrying out with devotion the instructions of the preceptor. Filled with the hope that the preceptor would impart the Supreme Knowledge, the disciple had a sacred bath and was on his way to the preceptor. 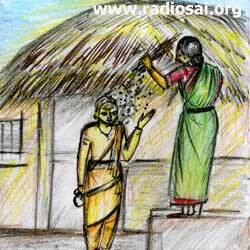 Unaware of the presence of the disciple, a maid was sweeping the ashram (hermitage) premises and the dust from the ground fell on the young man. Immediately, he lost his temper, as he felt that his purity after a sacred bath had been sullied by the dust that fell on him. He was angry with the maid for allowing the dust in fall on him. He looked at her angrily and she became frightened. The disciple went in and offered his salutations to the Guru and said, "Guruji! I have been waiting for a year to secure your grace. The time is now ripe for realising it. I am eager to receive the Supreme Knowledge from you." The preceptor said, "You are not yet competent to receive that knowledge. You have the qualities of a snake. You got angry with a girl who unwittingly caused some dust to fall on you. How can the supreme knowledge of the self be imparted to one who has not even this amount of forbearance? Go back and practise the sadhana (spiritual practice) for one more year." At the end of the second year, when the disciple was about to come to the ashram, the preceptor instructed the maid to see that as she swept all the dust should fall on the disciple. 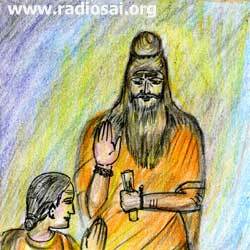 The maid told the guru that on the previous occasion the disciple had been angry with her, and this time if she repeated the offence, he might beat her. The guru told her to do as directed by him. In accordance with the directive of the Guru, she swept the dust on the disciple in full measure. Enraged at her conduct, the disciple went to beat her but refrained from doing so. "You have not yet acquired the competence to receive the knowledge. You are exhibiting the qualities of a dog. Come back after ridding yourself of these animal qualities." 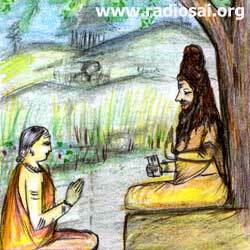 At the end of the third year,the disciple was coming to the ashram after a sacred bath. 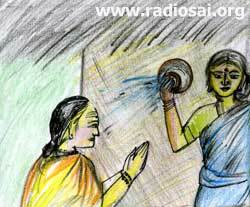 Carrying out the instructions of the Guru, the maid of the ashram poured some dirty water on the disciple. "Mother! My salutations to you. You have helped to strengthen my forbearance so that I can be worthy of the preceptor's grace." Without getting angry with her, he told her that he would be always grateful to her for what she had done to him. When he went in, the Guru welcomed him and said: "Son! Today you have become eligible to receive the Supreme Spiritual Knowledge." The lesson of this story is that every spiritual seeker has to get rid of attachment to the body. But, that is not enough. The egoistic feeling should be totally eliminated. The sense of possessiveness should be expelled. Only then can one realise Divinity. The preceptor drew the disciple close to him and imparted to him the Brahma-Jnaana (Supreme Spiritual Wisdom) and filled him with bliss. - From Baba’s discourse on 14th Oct 1995 .